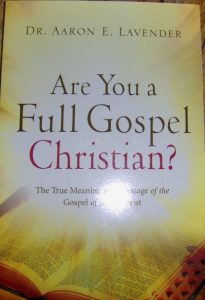 Are You a Full Gospel Christian? Dr. Lavender is the pastor of Grace Baptist Church in Kansas City and is also Vice President of Carver Baptist Bible College and Theological Seminary. His thoughts on the danger of the Charismatic movement, especially the health and wealth gospel, are pointed and also timely. I appreciate him sending me a copy!